Energy & Utilities - Camden County Council On Economic Opportunity, Inc.
Camden County Council On Economic Opportunity, Inc. Contact us to determine if you qualify for the Weatherization Assistance Program, a nationwide program to assist homeowners and tenants in improving the energy efficiency of their homes. You could also be eligible to receive assistance through our Home Energy Assistance Program and our Universal Service Program. These programs offer monetary assistance to help households cope with energy cost. With proof of a medical need, cooling assistance is also available to qualified applicants. Our Weatherization Assistance Program (WAP) provides a variety of energy-saving measures that include heating systems, hot water heaters, refrigerators and air-sealing solutions. In addition, refrigerator replacement, installation of florescent light bulbs, repair or replacement of broken/inefficient furnace, boiler/hot water heater, windows and outside door(s) may also be provided. The Weatherization, Home Energy Assistance and Universal Service Programs offer an easy process for clients to apply for energy assistance. Please click on the State of New Jersey's website here﻿ (on the right-hand side under Related Links) to view the application, eligibility requirement, and the process for weatherization assistance. To apply and or more information, contact the Home Energy Department at (856) 910-1180 and the Weatherization Department at (856) 910-8816. New Jersey Statewide Heating Assistance and Referral for Energy Services (NJ SHARES) is a statewide energy assistance fund that offers financial help to individuals and families needing temporary aid in paying their electric, gas, and water bills. The program assists households that do not qualify for the Low Income Home Energy Assistance Program (LIHEAP), or USF. Each client is required to fill out an application in which eligibility is determined by income and household size. The grant maximums are $700 for heating and $500 for electric service. The program is available year round, based on funding availability. Required documents are: (1) Proof of Income (last four consecutive weeks prior to application date), (2) Proof of Identification, (3) Most recent energy bill, and (4) Signed application must be furnished at the time of intake. To apply and for additional information, call us at (856) 964-6887. 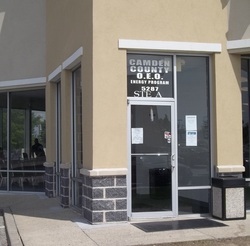 Copyright © 2014 - Present Camden County Council On Economic Opportunity, Inc. All Rights Reserved.